The Afghan Government is taking steps to tackle a reported regrouping of Taleban and al-Qaeda factions in the south of the country. Around 5,000 police have been sent to the southern town of Spin Boldak, near the border with Pakistan. 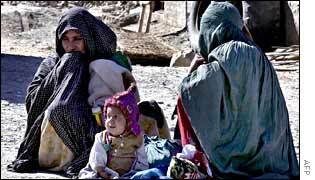 Sources have told the BBC that some former Taleban activists are trying to re-group in the region. There have also been reports of clashes between alleged Taleban activists and Afghan government forces in the area. The districts of Loye Karaiz and Bala Jar in Spin Boldak were the areas affected by the fighting. The head of security in the city, Mama Ubaidullah, told the BBC they had information that a wanted Taleban leader, Hafiz Abdur Rahim, was living there. He was believed to be staying in the Loye Karaiz area - but may have escaped the city altogether. During one clash with an alleged Taleban group, Mr Ubaidullah said the security forces killed four people and injured four others. A further five people were arrested. He said all nine surviving suspects were sent to Kandahar for further interrogation. Mr Ubaidullah was confident there was no difficulty in establishing peace in the area. He said the Taleban, while under the leadership of Mullah Muhammad Umar, had achieved nothing and questioned the power of just 10 or 12 activists. Spin Boldak's administrative officer, Hajji Fazal Din Agha, confirmed that several clashes had recently taken place. He said officials had been tipped off that a group of Hizb-e-Islami or al-Qaeda militants was planning to regroup in the area - but Afghan forces raided their hideout and arrested two people. The Pakistani authorities maintain strict security measures on their side of the border. A fortnight ago, some Afghans were arrested after crossing the border illegally - but were later released. Pakistan has reportedly deployed about 60,000 troops along the 1,400 kilometre Pakistan-Afghan border. The US has reportedly provided aid worth about $73m to keep an eye on the border. As part of the package, several helicopters, a large number of vehicles and communications equipment were recently provided to the border forces.